Yuma is a tri-color male German shepherd mix. His age is estimated at around eight, though he could be younger. Yuma is a very gentle dog, pleasant to be around. He is good on walks and doesn’t pull on the leash at all. 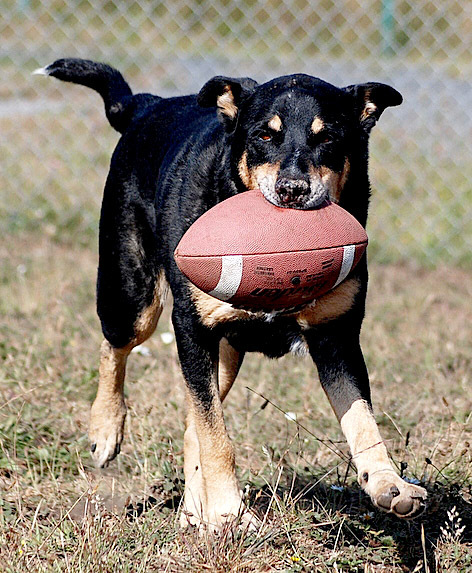 He is another member of the shelter football team and loves to fetch! Yuma will bring the ball back and give it up to be thrown again. He would love to have the opportunity to walk and play ball with his own family! He gets along well with other dogs also. Come meet Yuma today and see if he is the dog for you! Yuma is neutered, microchipped and up to date on vaccinations. He has been at the shelter since July 10 and his ID number is A063960. Her ID number is A064236. For more information about Yuma and Anna, call the Humboldt County Sheriff’s Animal Shelter at (707) 840-9132. 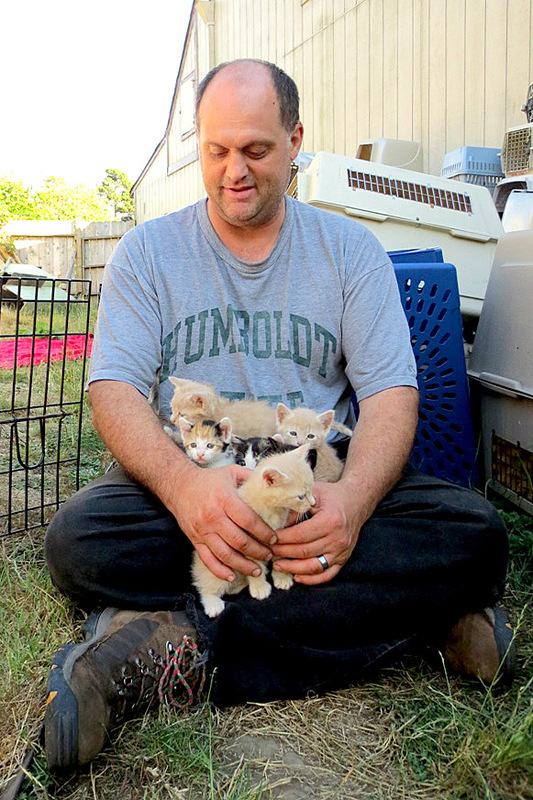 Pictured with Delightful’s kittens is Jeff Sellers, a regular customer at CAF. Jeff used to come in and mostly visit with Trinity and the other adult cats, but more recently he has been sharing his love and kindness with the kittens! 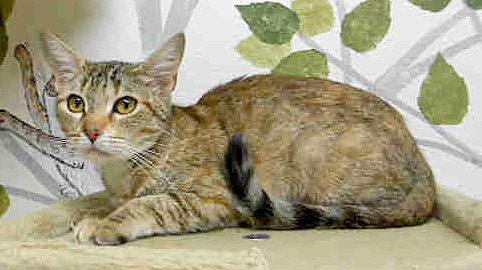 Delightful and her eight kittens are all doing wonderfully and soon these kittens will join the other adoptable animals in the cat room. Companion Animal Foundation (CAF) loves when visitors come and help socialize the animals. CAF very much appreciates their volunteers and all the wonderful community for support that has been given over the years. The best donation that one can give to the animals is time and love. Many of the rescue animals have not had much contact with people and would make the best companions if socialized at a young age. This entry was posted on Wednesday, September 11th, 2013 at 4:51 pm	and is filed under Animals. You can follow any responses to this entry through the RSS 2.0 feed.